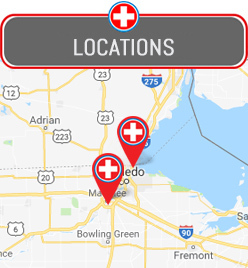 Northwest Ohio Urgent Care is a walk-in urgent care clinic located in Muamee, OH that focuses on providing fast and top-notch medical services to every member of the family. We save patients valuable time by offering walk-in services, so that you can avoid long wait times at the hospital. Our clinic is conveniently located at 1015 Conant St. in Maumee, OH and we are happy to serve the surrounding neighborhoods as well. If you are looking for great urgent care services in Maumee, then look no further than Northwest Ohio Urgent Care. Our clinic is open 6 days a week from Mon – Fri: 8am – 8pm, Sat: 9am – 5pm, Sun: Closed. In addition to our great hours and flexible walk-in appointments, our medical team at Northwest Ohio Urgent Care is experienced and compassionate when it comes to providing medical services. Our physicians are all Board Certified and can provide confidential care for children and adults. We have experience in pediatric urgent care and are happy to answer any questions that patients have about their health. We hope we can help you feel better soon at Northwest Ohio Urgent Care!